Annette Sweeney and her husband. The Iowa Senate officially had 50 members by 1:15 this afternoon. 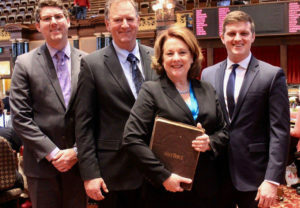 Republican Annette Sweeney of Alden won last week’s special election for an open senate seat and took the oath of office today. Sweeney has replaced Senate GOP Leader Bill Dix who resigned in February after images posted online showed Dix, who is married, kissing a lobbyist. 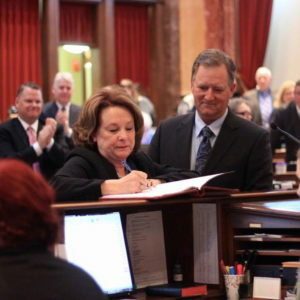 Sweeney admits she was emotional as her husband and two adult sons joined her in the center of the senate for today’s ceremony. Annette Sweeney and her family. Sweeney previously served in the Iowa House and was serving as U.S.D.A. rural development director for Iowa when Dix resigned. “When this opened up, I called my husband first thing and he said: ‘Go for it,'” Sweeney says. As she took the oath of office, Sweeney’s hand rested on a Bible her husband was holding. It’s the Bible her grandparents brought with them when they settled in Iowa in 1907.